Holiday seasons are just around the corner, and I am sure most of us will look for something nice to pamper our stomach. Based on November’s result, buffet like Saisaki Japanese Buffet, Shogun and Jogoya is still very much popular, or Lemon Garden Café’s Hi Tea Buffet or Tenji. Then we have Look Out Point for a nice night view, and perhaps something romantic for cave dweller in The Cave. For those who wanted a cocktail with the best view in the city, do visit Luna Bar and Sky Bar. For steamboat lover, we have Tasty Pot, Yuen Buffet Steamboat and Flaming Steamboat Buffet. For those who enjoy Malaysian style open air mamak, do try Murni or William Mamak. Other more posh café includes Fullhouse, Bumbu Bali and Delicious Café. If you like Japanese food, do try Hajime, Xenri, Shabu-Shabu, Matsuba, Rakuzen, Nihon Kai and Ninja Jones. For Chinese food, you can try Marco Polo, Noble House Imbi, New Paris or Lala Chong. Do check out the most popular and most visited places for 2009, before the end of it. Do you want to advertise in Malaysia’s No 1 Restaurant Website, with 4,124 restaurants listed and 108,552 readerships every month? Visit Malaysia Most Wanted Food & Restaurants. Now you can advertise for a whole year long in Malaysia’s most exciting and popular restaurants directory and search engine for RM 300 only. Promotion starts from now until 31 December 2009, while spaces still last (maximum of 50 slots only). Sign Up now! For better visibility, Malaysia Property Prices show distribution of residential area and its estimated market price throughout entire Puchong area using Google Map. Every location and taman in Puchong is shown its actual location in Google Map, so that you have a better understanding of its location and prices. Malaysia Most Wanted: Property Prices manage to cover about 90% of Puchong area which are actively on sale/rent for the past 6 months, which include 44 location / taman. 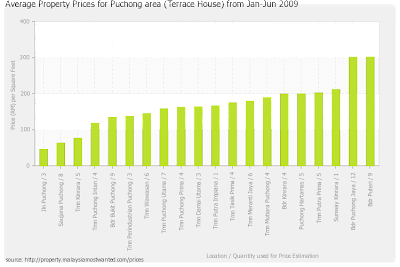 We generate a comparison chart of Average Property Price for Terrace House in Puchong area for the past 6 months. 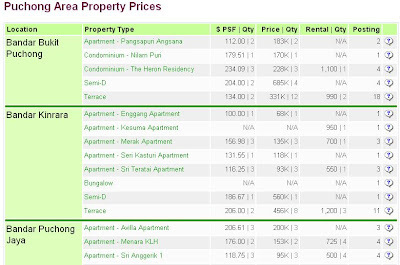 It seems like Bandar Puchong Jaya and Bandar Puteri is 2 of the most expensive area in Puchong, costing around RM 300 per square feet. We shall strive to provide more accurate data and cover more areas in the very near future. Three of the most important aspect of property price analysis is location, location and location. Besides knowing where, we need to know the surrounding areas and its public amenities. For young family, we need to know if the school is nearby. For convenient, we need to be near to hypermarket. For lifestyle, it needs to be near shopping. For a healthy living environment, we need parks and shopping complex. 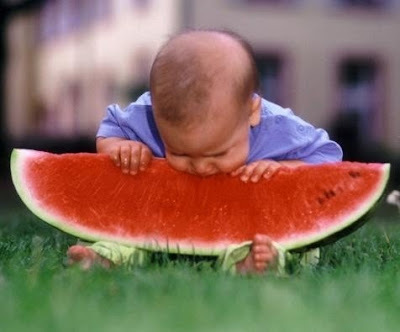 For happiness, we need lots of good food around. With Malaysia Property Price Analysis with Google Map plus Public Amenities Landmarks, we will show you what you need to know. Besides showing the property price trend and analysis, we think it's important for you to know the actual location of your future dream home. 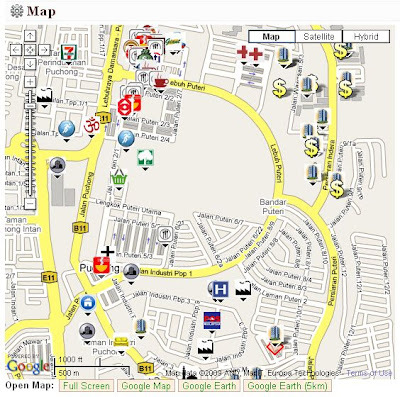 For those not familiar with areas such as Puchong, we added Google Map integration to show you where the actual property is located. From there, you could find the nearby properties within 5km radius. What’s next? We will show you what the nearby amenities (banks, markets, parks, etc) are. In the meantime, visit Malaysia Property Price Analysis! The original idea behind Malaysia Most Wanted is property analysis, where we shall provide the price trend so that you know which area is performing better. We start with listing of new properties followed by food to create awareness of the existence MMW, so that when we finally have the price trend, you can actually find it. We try to secure some funding through this and this, but they claim the idea is either useless or can’t make any money. I do agree making money might be difficult (and I am giving away this information for free), but the idea of property price trend is far from useless. At the end, we have no choice but to self fund. Today we finally took the first step to analyse the property price trend for Puchong area, where you could see the price and rental movement for the past 6 months. We categorise them nicely into location and property type (apartment, terrace, bungalow, etc) so that the estimation is slightly more accurate (though not perfect yet). The prices shown here are asking price, meaning the price owner or agent ask for when they put up an advertisement for sale/rent (so it is not the actual transaction price, as such information is pricy and not open to public). This is just the first baby step where we have more features in the pipeline. Not good enough? Don’t worry; we will come up with more data (covering more areas), integration of map, comparison charts and many more! Stay tune to Malaysia’s one and only Property Price Analysis! 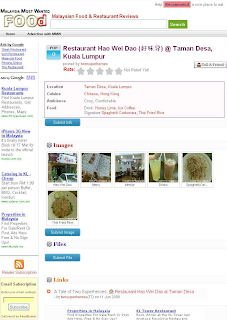 The May 2009 Most Visited Food Venue (based on Google Analytics pageview), brought to you by Malaysia Most Wanted Food and Restaurants. Saisaki and Shogun had dominated the top 2 spot for quite a while, and Look Out Point is the new No.3. Li Jin @ Pavilion KL is gaining popularity probably due to their promotion on newspaper, and The Cave @ SS2 is also becoming popular as the “couple place”. Then we have the regulars like Yuen Buffet Steamboat Restaurant and Restoran Shabu Shabu. Jogoya is still holding at no.8 spot and the exclusive Hajime Japanese Restaurant at no. 10. Others include Bumbu Bali and Delicious Café. The elusive William Mamaks is gaining momentum at no. 13, followed by other new comers such as KOKOPELLI Travellers Bistro @ PJ, Full House @ Ara Damansara, Nancy’s Kitchen @ Jonker Street and Carnaval Churrascaria @ Damansara Jaya. After reading on TheEdge’s netv@lue 2.0 review (May 04, 2009) of FriedChillies.com which boast 1.5 millions hit per months, MMW Food feel the urge to check out the current state of Malaysia Food websites. I start googling for “Malaysia Food” and “Malaysia Restaurant” and start feeding all the Malaysia food-related websites into Google Ad Planner (bloggers hosted on blogspot.com cannot be added due to some technical reasons) to check our their monthly web traffic (other tools include Alexa, Compete and Quantqast). To my delight, malaysiamostwanted.com is at the number 1 spot with 100K Unique Visitors and 560K Page Views per month. To be fair, only 75% of the traffics belongs food.malaysiamostwanted.com. Food & Travel blogger vkeong.com is at second place with 30K monthly Unique Visitors followed by goeatout.com.my. 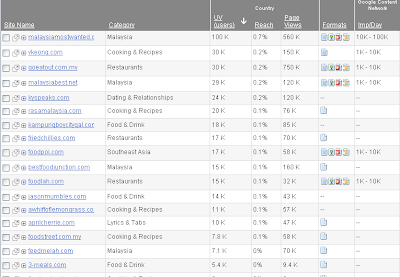 malaysiabest.net, kyspeaks.com and rasamalaysia.com are in the top 5 as well. Web Traffic Estimation from Google Ad Planner is not 100% accurate, but it can give a good estimated if used together with other tools such as Alexa. Again, all results are estimation on best effort basis by Independent party. Malaysia Most Wanted Food is a purely Internet only Food Directory and Search Engine which links to thousands of independent reviews by Food Bloggers, thus we need to have the strongest presence online. Food Media Company might cover alternate media beside Internet such as Magazine, TV, Newspaper, Coupon, Road Show and etc. Food Bloggers gave the most genuine and independent reviews with a personal touch. With all the Internet Buzz about Twitter, Malaysia Most Wanted (MMW) had decided to give this simple yet noisy social network / micro blogging platform a try. Why twitter? Basically it will be used as compliment to this Blog. We will make major announcements through this blog as usual, and smaller updates and changes will be introduce through twitter for those who are interested. We want to ensure only the genuine good and popular eatery got listed as Malaysia Most Wanted Food top listing, and we had tweak the algorithm to better determine Top 50 places and penalized those who try to increase their ranking by abusing the Rating System. Malaysia Food: Poll is our second Gadget for Malaysia Food & Restaurants Poll. It is a simple gadget / widget to gather opions on find the best places to makan in Malaysia, such as Where to find the best Nasi Lemak in Klang Valley? Click the above Google icon to add to iGoogle, or add this gadgets to your website or blog. We had created our first Google Gadget (or Widget) for Malaysia Food. It shows a random picture of Malaysia Food, and if you are curious where the delicious looking food is served, just click on the image and it will bring you to the right place. You can add this gadget to (iGoogle) or your blog (webpage). Have fun! Malaysia Most Wanted (MMW) finally decided to start its own Advertising Program after months of consideration and planning. We got the right amount of traffic now, and we start to get some enquiries from restaurant owners. The economy is going into a recession now, so it sure could use some affordable and effective advertising avenue. We kickoff the advertising program for MMW Food this week, and we would do the same for MMW Property and the entire MalaysiaMostWanted.com Network very soon. Malaysia Most Wanted Food & Restaurants received a minor face lift (major platform upgrade) about a month ago and everything seems to be running smoothly now. Integrated Search Bar with Simple, Advance and Google Search. We enhance the Search Engine slightly to return more relevant results when the search phrase contains more than one word. Better looking page on the venue pages, with “Tell A Friend” feature integrated. Newly recommended food venues are automatically posted as Venue immediately. 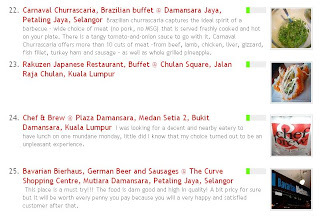 The February 2009 Most Visited Food Venue (based on Google Analytics pageview), brought to you by Malaysia Most Wanted Food and Restaurants. Some of the new places gaining popularity for this month are Red Island Café (Bayan Lepas, Penang), Fullhouse (Ara Damansara), Roadhouse Grill (Jalan Ampang) and Villa Danieli (Sheraton KL). 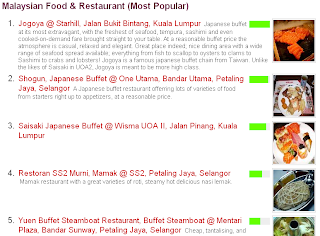 The January 2009 Most Visited Food Venue (based on Google Analytics pageview), brought to you by Malaysia Most Wanted Food and Restaurants. New year new outlook, but something just never change for quite a while. 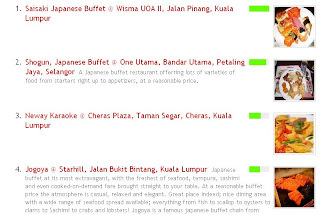 We have Japanese Buffet for the top 2 spots, and Cheras New Way Karaoke dominated the 3rd spot (I have to remove this from the list as it sort of undermine MMW Food’s authority, but funny) and Jogoya had gone to number 4. We have the usual favourites like Look Out Point for affordable view and great night view, and the affordable Yuen Buffet Steamboat. The classy Japanese Restaurant Hajime is at No.7 followed by Tupai-Tupai (malay food). Chinese Restaurant Marco Polo is a popular choice during Chinese New Year, and the illusive Williams Mamak made Top 10 as well. Others notable goodies include the affordable and fast New Paris Restaurant, the classy Sky Bar, Lala Chong seafood, the Cave for couple and Restaurant Shabu Shabu for cheap Japanese Steamboat on weekdays. Notable new comers include Island Red Café (Penang), Tasty Pot Steamboat, Jaya Palace Restaurant, Xenri, Pantai Seafood Restaurant and Wong Poh. 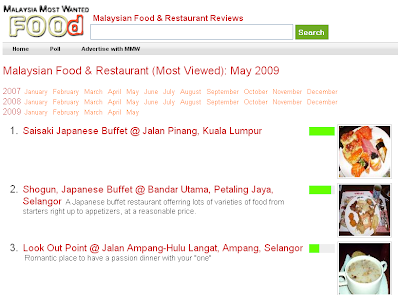 The December 2008 Most Visited Food Venue (based on Google Analytics pageview), brought to you by Malaysia Most Wanted Food and Restaurants. 2008 has been a good and satisfying year, and MMW Food had recorded more than 4000 eateries for everyone's enjoyment. It had always been close to our heart to unearth the best food in Malaysia, and to judge food based on popularity, voting and comment is just a few ways we explored in 2008. For 2009, we are more determined to find more food gems in Malaysia, answering question such as "Where is the best Fried Keow Teow in Klang Valley?". Stay tuned until we got most of these delicious questions answered in 2009. It had been a fun and fulfilled year for Malaysia Most Wanted (MMW) in 2008, with lots of launching and enhancement, with a few more unrealized projects and potential. We put in a full load of enhancement for Malaysia Food with Voting System, Location & Cuisine Listing, Food Listing, Advance Search and Map Enhancement. We officially launch MalaysiaMostWanted.com as the main portal for all MMW’s offerings. 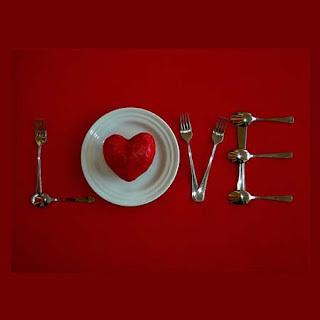 More ways to search for food, and offering for the most romantic dining place in Malaysia for Valentine. Malaysia Property is featured on TheEdge Malaysia. A new version of Malaysia Property is launched. RSS for Food, and Google Search for Property. 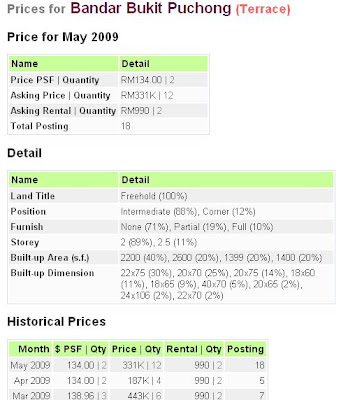 Major enhancement for Malaysia Property with better search and ranking by popularity. Beta Launching of Malaysia Most Wanted EVENT! Listing of best places for Merdeka Eve Celebration. Malaysia Event and Festival Calendar. MalaysiaMostWanted Office is closed for 3 weeks for Annapurna Circuit adventure in Nepal. Upgrade of MMW’s server due to increasing traffic. Beta launching of Malaysia Most Wanted Map and listing of best Halloween Party weekend in Malaysia. Practical Testing of Malaysia Food in Penang, and closing with listing of New Year Eve countdown party! It is really a great year for Malaysia Most Wanted, with growing visitors and participations thanks to your support. We hope MMW will continue serve its purpose of finding the things you need in Malaysia easily with its services such as Food & Restaurants, Property & Real Estates, Events & Festivals and Map & Places.